Jackie Bradley Jr. hit a grand slam, Nathan Eovaldi hushed Houston a day after some social media trash talk and the Boston Red Sox beat the Astros 8-2 on Tuesday to take a 2-1 lead in the AL Championship Series. Red-hot slugger Alex Bregman had shared a video Monday on Instagram of Houston hitting back-to-back-to-back home runs off Eovaldi in his previous outing against the Astros in June. Eovaldi downplayed the post when asked about it Monday. 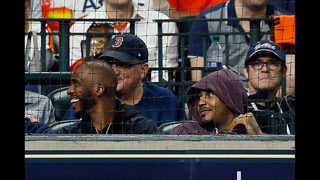 Chris Paul and Carmelo Anthony of the Houston Rockets attend Game Three of the American League Championship Series between the Boston Red Sox and the Houston Astros at Minute Maid Park on October 16, 2018 in Houston, Texas. Jose Altuve #27 of the Houston Astros celebrates scoring a run in the fifth inning against the Boston Red Sox during Game Three of the American League Championship Series at Minute Maid Park on October 16, 2018 in Houston, Texas. Steve Pearce #25 of the Boston Red Sox celebrates with Rafael Devers #11 after hitting a solo home run in the sixth inning against the Houston Astros during Game Three of the American League Championship Series at Minute Maid Park on October 16, 2018 in Houston, Texas. 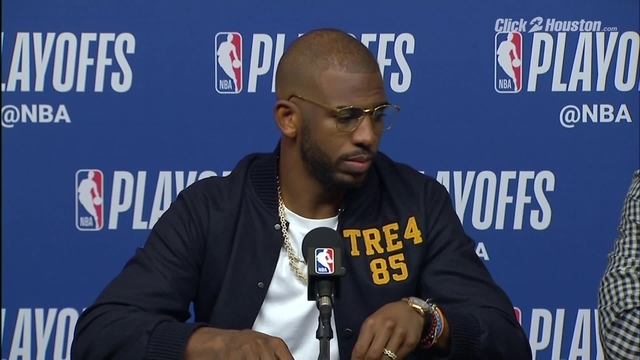 Rapper Slim Thug attends Game Three of the American League Championship Series between the Boston Red Sox and the Houston Astros at Minute Maid Park on October 16, 2018 in Houston, Texas. Alex Bregman #2 of the Houston Astros fields a ball in the fourth inning against the Boston Red Sox during Game Three of the American League Championship Series at Minute Maid Park on October 16, 2018 in Houston, Texas. Josh Reddick #22 of the Houston Astros catches a deep fly ball hit by Ian Kinsler #5 of the Boston Red Sox (not pictured) in the fourth inning during Game Three of the American League Championship Series at Minute Maid Park on October 16, 2018 in Houston, Texas. Dallas Keuchel #60 of the Houston Astros reacts in the third inning as a play is reviewed against the Boston Red Sox during Game Three of the American League Championship Series at Minute Maid Park on October 16, 2018 in Houston, Texas. Marwin Gonzalez #9 of the Houston Astros hits a RBI single in the first inning against the Boston Red Sox during Game Three of the American League Championship Series at Minute Maid Park on October 16, 2018 in Houston, Texas. Osuna had two on and two out when he hit pinch-hitter Brock Holt in the shoe. Plate umpire Joe West didn't see that Holt was hit, but Cora challenged successfully for the hit-by-pitch. Osuna then drilled pinch-hitter Mitch Moreland. 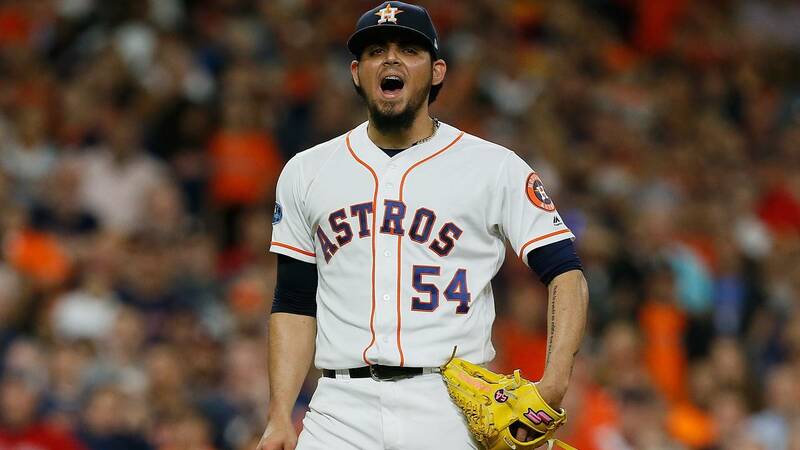 Osuna was a controversial midseason pickup from Toronto while he served a 75-game ban under Major League Baseball's domestic violence policy. Pearce nearly delivered an extra-base hit with two on in the third, but 5-foot-6 left fielder Tony Kemp jumped at the wall and came up with Pearce's towering fly. Replays showed the ball may have clanked off the wall just before falling into Kemp's mitt, but umpires upheld the decision when Boston challenged. Keuchel's lousy first inning was a continuation of problems he had in the regular season when he allowed 26 runs in the opening frame to give him a 6.88 ERA in the first inning. He settled down after that to pitch four scoreless frames before Smith took over to start the sixth. Morton will make is 2018 postseason debut. Morton, who spent time on the disabled list late in the season with shoulder discomfort, hasn't pitched since Houston's regular-season finale on Sept. 30. Porcello was scheduled to start Tuesday but was pushed back a game after he pitched in relief in Game 2.